Researchers at Stanford University have developed a microphone for use at any depth and water pressure in the ocean, and is sensitive to a wide range of sounds. The research on the microphone, funded by Litton Systems, a subsidiary of Northrop-Grumman Corp., is published in the Journal of the Acoustic Society of America (paid subscription required). A microphone detects sounds by means of a membrane or diaphragm inside it that vibrates in response to the pressure waves of sound that reach it. On land, air pressure is constant, thus the ambient pressure on the microphone is not a factor affecting the microphone’s ability to distinguish sounds. Underwater, however, is a different story. In the ocean, for every 10 meters below the surface, water pressure increases by the equivalent of 1 atmosphere — the air pressure felt at the surface. Current undersea microphones have limited ranges of sensitivity and do not perform well at depths, where the crushing pressure can make it difficult to detect faint sounds. 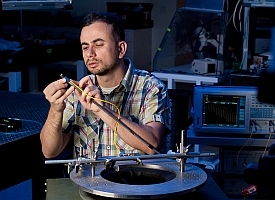 In order to develop a microphone with sensitivity that could withstand the water pressure at great depths, electrical engineering postdoc Onur Kilic (pictured at top) and colleagues let water flow in the microphone, thus equalizing the pressure inside and outside of the device. While the water equalized the pressure, it also drastically limited the extent a microphone’s diaphragm or membrane sensor could move in response to sound waves it detected. To create a device with more sensitivity, Kilic’s team built a silicon chip with a membrane about 500 nanometers thick and drilled a grid of tiny nanoscale holes in it, to allow water to pass in and out. One nanometer is equal to one-billionth of a meter and 500 nanometers — the thickness of the microphone’s membrane — is about 25 times thinner than common plastic wrap. The team then developed a laser-based device, taking advantage of lasers’ capabilities of detecting tiny movements. Kilic ran a fiberoptic cable into the water-filled microphone, with the end of the cable positioned near the inside surface of the diaphragm. He then sent light from a laser out the end of the cable onto the diaphragm. The nanoscale holes in the diaphragm membrane allowed water to pass through, but were equivalent to the wavelength of the light from the laser. Thus the nanoscale holes filled with water served another function, namely to reflect the light trying to pass through the membrane. This capability to reflect light in effect turned the diaphragm into a mirror, which reflected the light back via the fiberoptic cable. The microphone therefore turned sound waves into light waves, the intensity of which — even in small increments — an optical device could detect and measure. To cover a full spectrum of sounds, a range of 160 decibels, Kilic and colleagues found they needed three of these diaphragm devices, each tuned to a different part of that range. The small size of the devices however, about 0.3 millimeters, made it possible to bundle the three diaphragm into one, still miniature, device. The result is a microphone that can detect a range of ocean sounds, from the equivalent of a soft whisper to an explosion of a ton of TNT just 60 feet away, and do so accurately at any depth. It also can hear sound frequencies across a span of 17 octaves, spanning pitches far higher than the whine of a mosquito and far lower than a rumbling foghorn.